Preheat the oven to 350 degrees and spray a sheet pan heavily with vegetable oil. Add the LC-Gluten Free Breading & Crusting Mix, Italian seasoning, and garlic powder to a large food storage bag, seal and shake to mix. One at a time dip each chicken cutlet first into the beaten egg and then into the bag of seasoned LC-Gluten Free Breading & Crusting Mix, shaking to coat. Place the coated chicken breast cutlets in a single layer on the well greased sheet pan and bake for 25-30 minutes until the chicken is thoroughly cooked; turning each piece over half way through cooking to ensure even browning. Meantime in a medium bowl, combine the hot sauce and melted butter and set aside. A few minutes before the chicken is done cooking, add all the Gorgonzola Cream Sauce ingredients to a small pan over medium heat. Stir constantly for 4 to 5 minutes, just until the gorgonzola cheese melts and all ingredients are combined. 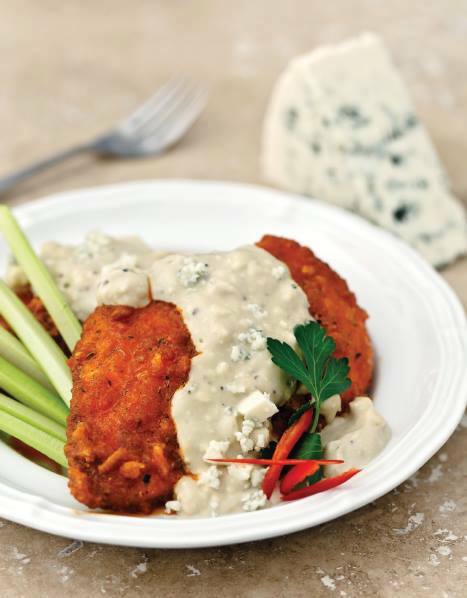 When chicken is finished cooking, remove from oven and quickly toss each piece in the bowl of hot sauce and butter to coat well before serving draped with the warm Gorgonzola Cream Sauce. 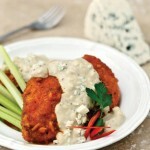 Serve with celery sticks, if desired! Always use full-fat mayo, and especially cheeses, as low-fat cheeses don’t melt properly and they most always will have added sugars and even starches! Careful not to let the cooked chicken sit in the hot sauce and butter or it will become soggy and too hot! And if the chicken is not crispy on top, you can always place the sheet pan in the center of the oven and let it sit under the broiler for just a few seconds to crisp.